Working from home is exciting because it offers an opportunity for real comfort and efficiency, but if the office is too casual, or isn’t effectively separated from the home environment, peak productivity may be lost. While comfort is essential in any office, an office that is too casual may seriously impede the ability to get things done. You have to find a way to separate yourself from the rest of the goings-on in the home and to convey a sense of “off limits” to all other normal and natural home sounds and interruptions. A distinction has to be made regarding the physical boundaries of this working space. The most effective way to do that is with the design of the space itself. Will I be making conference calls? Will I be video conferencing? The answers to these questions will begin to develop the program for your home office. Keep all of your work in that space because it’s important that you be able to find things, retrieve things and be efficient within this space. You will also want to keep the non-office space in your home free of work items. This promotes healthy balance and allows you to relax at home when you are not at work. What are the most common mistakes people make when they’re setting up a home office? Thinking you can “tune out” the plasma screen on the wall. Don’t hang it anywhere near where you’ll be working. 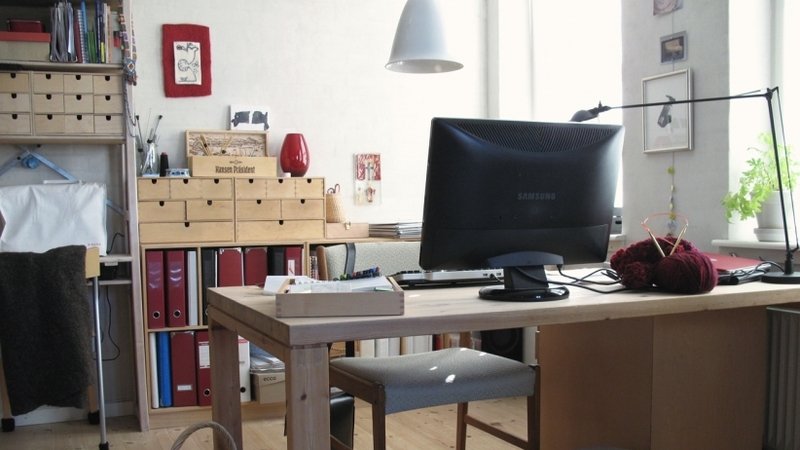 What are the most important five things to consider when you’re setting up a home office? Equipment. Speed and efficiency are critical at home. But make careful decisions. Question whether that large color copier is a real necessity or if a trip to the neighborhood Kinkos will suffice. Don’t pay for equipment you won’t use on a daily basis.Investigate a wireless hub for your office so you have the flexibility to work on your laptop from your desk, your chair or a table, and at both standing and sitting heights. This simple option can enhance your creative problem-solving and thinking ability.You’ll want a separate phone line to your office so no business associate or client gets a busy signal. Also, make sure your phone has the capability for messaging, conferencing and speaker functions. Be sure you have a local and responsive computer support team that will make home service calls promptly. You need to know you can rely on the equipment you have to work. Be sure you invest in the fastest equipment available, so you don’t spend your time waiting for things to work. And don’t forget insurance on that equipment. Affordable policies will insure your home office equipment in the event of a loss or disaster. You’ll want this peace of mind. Many insurance companies offer special coverage for home workers. Lighting. Good lighting is essential. Ideally you want as much natural daylight as possible. If your space has a window, it will enhance the lighting. Daylight is the most evenly balanced source of white light available, in that sunlight has an approximately equal proportion of each color of the spectrum. This light, however, never has a constant color and its beauty comes from the way it is reflected and from the way it is refracted by the earth (as in differing times of day). The color of natural light also differs based on geographic location. It is always beneficial to have as much natural light as possible in the working area.If no daylight is available, a combination of general and task lighting will be required. A high-quality task light will be essential for late nights or cloudy days. If your home office is in a basement or a room without windows, check out daylight-replicating light sources that will provide energy-efficient, full-spectrum lighting. Many ergonomic task-lighting fixtures have dimmer switches so you can control the amount of light.The most effective lighting brings out the fullest quality of the colors illuminated. If lighting levels are too low, there can be negative psychological effects, including depression. For human comfort, a yellow-cast illumination is best. It is the color of brightness, and midway through the color progression from cool to warm. To avoid glare, don’t place overhead lighting directly above computer screens, and don’t put a computer screen directly in front of a light source. That will cause eyestrain. Layout/organization. The old rule, “a place for everything and everything in its place” was coined to relieve stress. If you have carefully thought through your storage requirements, you’ll have the space you need.The desk surface of your choice will serve to support your laptop or desktop computer and work-related items. Your desk will likely be the place where you spend the most time. Consider the myriad of options available for organization of papers on your desk. What is essential for productivity is an organized desk that keeps pending work in order and prevents the chaos of disorganized piles.Solutions are as simple as pencil cups or trays to keep all writing instruments in one place, plus memo and business card holders so, literally, there is a place for everything. Shops such as The Container Store make it easy for you to get organized and stay that way. In this day and age, there are so many options for storage, the challenge is more in finding what works best with your flow of paper and work. Do you find yourself working from left to right? Does your paper trail have a distinct flow? Remember than when planning how you store your items. Italian product designer and manufacturer EmmeBi has amazing examples of how it organizes an office, both commercial and residential. You can use those ideas for inspiration and, if your budget requires a more modest approach, mimic the same look with some of the items found at Target , Ikea and similar stores. Ergonomics. Your health, safety and welfare are critical. Therefore, the items you choose should be ergonomically designed to promote your health and well-being while using them.Chair manufacturers have made significant improvements in adjustability and comfort for computer users. They have even researched the biomechanics of seating. Task chairs reflect this research and are making individuals’ lives easier even when they work on a computer the entire day.Keilhauer has produced chairs that feature a pelvis balance point and free shoulder technology. They are truly kind to your back and spine during computer work. Another favorite of ours is Humanscale . It has also taken a great amount of time and effort to study the needs of the human body when it comes to working. If you are in a position where you write or create most of the time, the company’s chairs are an investment you will be thankful for for many years.Consider foot rests, ergonomic mouse instruments shaped to fit your hand and soft keyboard pads that allow rest and relaxation for the wrist, and foot rests. All enhance the work experience and make your time at work less stressful to your body. The goal is make work comfortable for your body and to support the areas of the human form that are brought into play with the work you do. How can you set up an office to take advantage of the “green” mind-set? Consider sustainability. Computers contain hazardous materials such as heavy metals, vinyl and toxic chemicals. They also rely on electricity for power. Keep the computer, your printer and other office equipment turned off when idle. Activate power-saving features on your computer. When trading in for new equipment, make sure your home office equipment will be recycled. Avoid throwing office equipment into the trash. A simple internet search will offer many options in your area. Keep the planet in mind. Eco-friendly design ensures earth-friendly materials. Consider items such as recycled glass countertops and specify materials that use resources most efficiently, such as woods from sustainable forestry and products that are recyclable. Use local and regional resources when available, as this keeps the money local, supports local business and keeps shipping and freight costs (as well as resources used) at a minimum. Also, don’t be afraid to look into ways to integrate energy conservation such as “daylighting,” which takes advantage of natural light. That will not only help you feel better as you work, but it will also help the planet. What are the best colors for an office? The psychology of color is real. Certain colors elicit emotional and physical reactions and responses from individuals. Color impacts mood and energy levels. Therefore, be aware of the psychological impact of the color you choose for your home office. Blues, greens and violets are considered cool colors. These colors evoke feelings of peace and relaxation. Blue can actually make a room feel cooler and can lull occupants to sleep. It’s an ideal bedroom color, but not an ideal office color. As the dominant color in nature, green is considered a neutral. We are very comfortable in green surroundings. Green evokes organic, fresh, restful emotions and can foster concentration. Today’s new brand images feature a lime green tint that combines yellow hues. This color can add freshness and vitality to an office. The addition of green to an office area will enhance its balance. Yellow grabs attention. That’s why the most popular highlighters are yellow. It catches the eye like no other color. It makes people happy and evokes optimism. But a bright yellow might be distracting or overpowering in an office area and could even cause a degree of anxiety. Red is energetic and stirring. It often produces strong feelings and can create excitement. If used in a home office, it should be used as an accent only. White, ivory, gray and tan can carry subtle variations of color. So they can be neutral with overtones of the colors you feel most comfortable with, such as a warm gray or a cool gray. These colors do not distract and can be combined with accent colors for vitality and energy. Accents and shades of purple have been proven to stimulate imagination. Purple or lavender tones cross the line between warm and cool tones and can evoke a favorable response when focus and concentration are required. With all colors, it’s important to test the colors on the wall in large enough areas to ensure compatibility. There is no real hard and fast formula for color associations. The color blending is subject to the occupant’s wishes. How would you sum up the concept of home office design? Your office should be a connection to yourself, your spirit and your productivity. It should afford focus rather than distraction and be a place you want to be and want to spend time in. That will positively influence you in the space and enhance the work you do there.